We recently had the chance to review a reusable bag from BAGGU. "BAGGU is a small team of designers, and entrepreneurs, founded on the principle that good design should be functional, beautiful and affordable. Our goal is to make basic products that fill lots of uses, not just one, so you can own less stuff. We believe in bright colors, high style, quality materials, and economy of use. We love BAGGU, and hope you will too." "Based on the form of the iconic plastic grocery bag, a BAGGU does the same job without harming the environment.Because reusable bags only reduce waste when you use them, we made BAGGU light weight, so it's easy to keep with you for an unexpected errand, and so beautiful you’ll actually want to carry it. 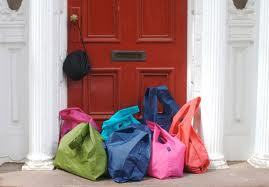 Using one BAGGU for one year replaces 300 to 700 disposable bags.Changing our own shopping habits is one small thing we can do to make a difference. Our best selling reusable bag is not just for the grocery store. Carry in your hand or over your shoulder. Holds the contents of 2-3 plastic grocery bags. 15” Wide / 25” high / 6” deep. Folds into a flat 5” by 5” pouch. Holds 50 lbs. 100% Ripstop nylon. Machine washable. 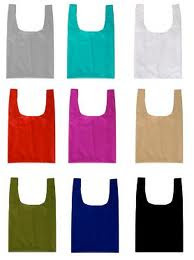 $8.00 each / 3, 4 or 5 bags $7.50 each / 6 or more bags $6.50 each"
What we thought: We really loved our BAGGU! It has been the perfect addition to our reusable bag stash. The variety of colors at BAGGU really impressed me...you can find every color of the rainbow and more, not to mention patterns! 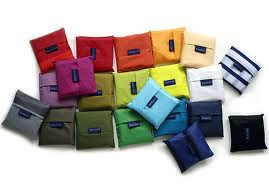 They are definitely super stylish and I love that they come with their own little pouch. Our BAGGU is a gorgeous blue color and it can really hold a lot of weight. I definitely believe it can hold up to 50 lbs which is pretty impressive! 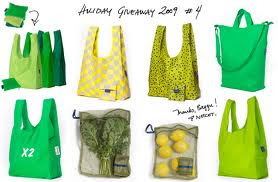 BAGGU carries beautiful bags with an effective design and our bag is helping us reduce our carbon footprint each shopping trip:) ABCD Diaries gives BAGGU an A+! Buy It: Find these awesome bags at BAGGU!! Disclosure: ABCD Diaries was given a BAGGU for review purposes only. We were in no other way compensated. The opinions expressed in this post are ours and ours alone.